LUBUMBASHI, DEMOCRATIC REPUBLIC OF CONGO – Robert Friedland, Executive Chairman of Ivanhoe Mines (TSX: IVN; OTCQX: IVPAF), and Lars-Eric Johansson, Chief Executive Officer, today announced highly encouraging results from the ongoing Know for Sure initiative sponsored by Ivanhoe and Zijin Mining to help control malaria in the Democratic Republic of Congo (DRC). The ground-breaking Know for Sure campaign is a collaboration with the DRC Ministry of Health and Fio Corporation, a Toronto-based, global healthcare technology company. The initiative has introduced integrated diagnostic and data technology to provide automated, rapid and reliable testing and real-time reporting in the DRC provinces of Haut-Katanga and Lualaba – two malaria-burdened regions that host Ivanhoe’s Kipushi Project and the Ivanhoe-Zijin joint venture Kamoa-Kakula Project. 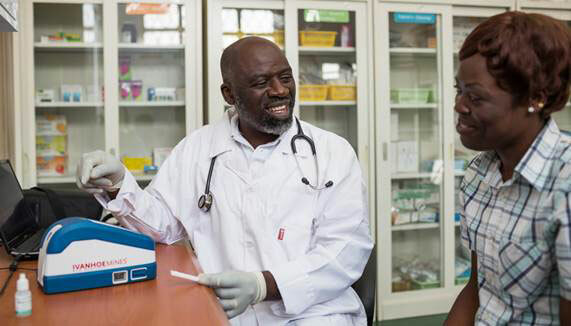 One significant overall benefit of Know for Sure is that a total of 248 private and public health facilities now offer on-the-spot malaria testing services to rural communities and urban centres, guiding treatment according to national protocols. 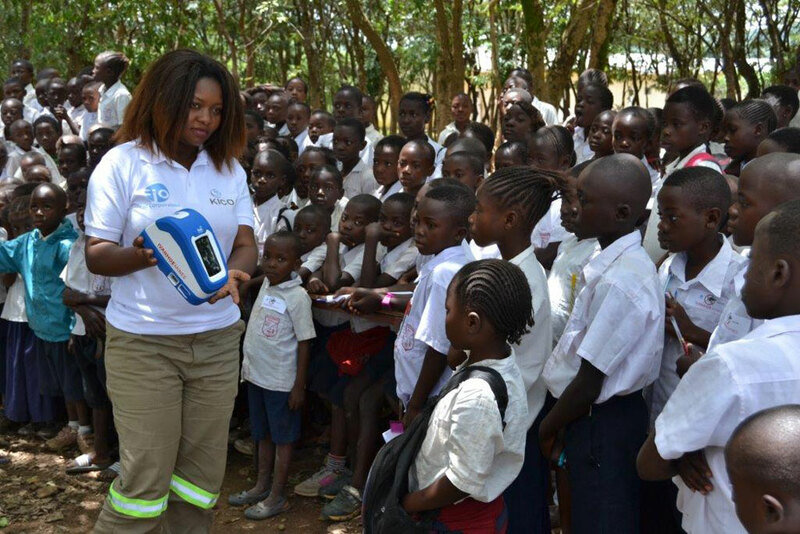 Health workers at these facilities are using 300 Deki Readers, Fio’s intelligent diagnostic device based on mobile phone technology, to help them more accurately diagnose malaria and record results. Diagnostic testing, using a Deki Reader, in one of 248 medical centres in southern DRC as part of a malaria-control initiative sponsored by Ivanhoe Mines and Zijin Mining. Deki Readers, used with commercially available, rapid diagnostic tests, offer step-by-step guidance for performing tests, automate the analyses and upload data to the Fionet web portal. They ensure the capture of patient information, symptoms and prescribed treatment information, and eliminate human error in reading diagnostic test results. Program health-care managers are able to log on to the Fionet portal to review real-time reports automatically generated from the data. 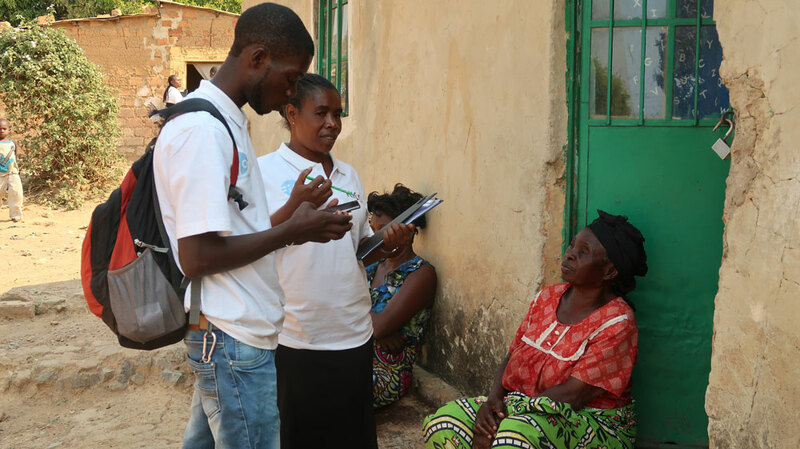 Since its launch in August 2015, the Know for Sure campaign has demonstrated its capability to strengthen the DRC government’s capacity to rapidly and reliably confirm whether patients seeking care have malaria, while at the same time gathering a wealth of new information for the provincial ministries of health. Data captured with Deki Readers are available online through the Fionet portal to authorized personnel at the DRC Ministry of Health and other stakeholders involved in advancing the fight against malaria in the DRC. The data effectively provide a real-time “malaria map”, which allows resources to be directed where they are most needed to help reduce the social and economic burdens of the disease. Dr. Santiago Ferro, Fio’s Vice President of Clinical Affairs, said routine use of Fionet by healthcare workers is creating a two-fold effect. More than 600 healthcare workers have been trained to use Deki Readers for clinical diagnoses. 15 Congolese “Master Trainers” have been trained to teach health workers and program managers how to integrate Deki Readers and the Fionet Web portal into their operations. More than 100 DRC government officials in the health sector have access to the online healthcare management portal to improve data-driven decision-making. National and provincial health managers use the portal more than 200 times each month to guide their program. 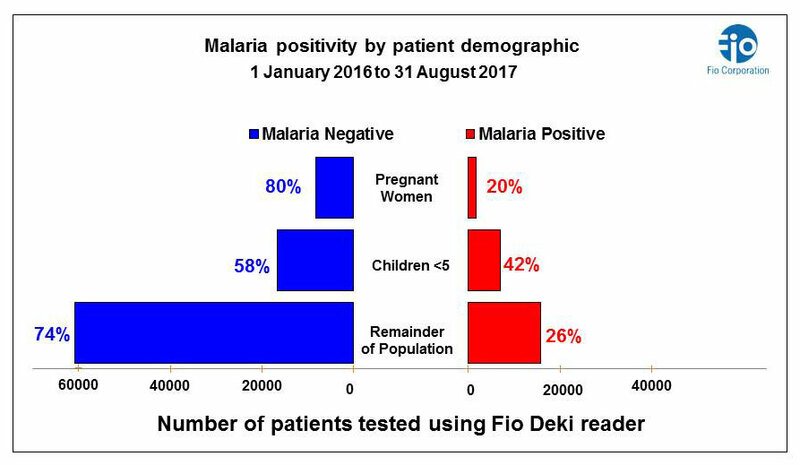 A total of 85,557 patients reporting symptoms characteristic of malaria (fever, chills, headache, and sweats) were tested with the use of Deki Readers up until the end of August this year. 69% tested negative for malaria, thereby saving unnecessary presumptive and costly medical treatment and allowing medical practitioners to focus on other possible causes of the illness. Health care managers use Fionet data to monitor stock and consumption of commodities such as rapid diagnostic tests and treatment medication, and performance of health care workers measured by error rates and throughput. Fionet positivity diagnostic data (people who report to clinics for treatment) can be used as a proxy for malaria prevalence to estimate the portion of people who are ill with the disease and to see changes and trends over time. Seasonal variations in positivity results ranged from an average of 29% during the rainy season (December 2016 to April 2017) to 12% during the dry season (May to August 2017). Decreasing annual trend in malaria positivity rate in all patients – from 49% to less than 33% (during the period January 1, 2016, to August 31, 2017). Significant reduction in annual malaria positivity in children under the age of five – from 60% to 42% (during the period January 1, 2016, to August 31, 2017). Understanding the demographics and targeting treatment with accurate diagnostics is an important factor in malaria control. 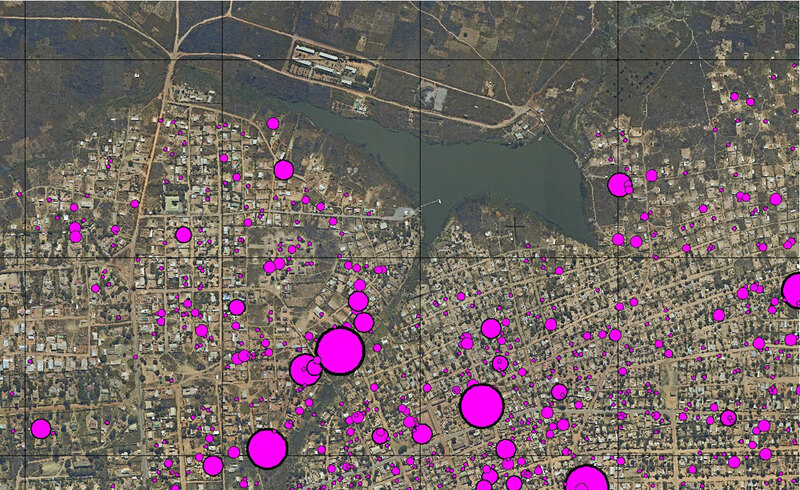 The Know For Sure initiative has taken this one step further to geographically map the distribution of malaria using mobile communications technology and connecting to a cloud server for access on the Fio Web portal. A census in the Kipushi municipality, where Ivanhoe is leading preparations to resume commercial production at the Kipushi Mine, has surveyed almost 10,000 households, representing almost 60,000 people, asking questions about rates of malaria. Some of the survey’s findings were not expected. One surprise was learning that the occurrence of malaria is not directly related to proximity to water bodies (where malarial mosquitoes breed), but is more related to population density – suggesting that infection via mosquitoes is passed on from person to person. Another surprise was that there is a difference of more than 3% between the prevalence of malaria in households with electricity (14.3%) versus households with no electricity (17.6%). Malaria cases in the month prior to the survey included more than 2,300 children under the age of five, and 145 pregnant women – both vulnerable groups. The total malaria prevalence in the population surveyed during the dry season was 15.4%. Malaria prevalence differs by a factor of more than two between the rainy season (when mosquitoes that transmit malaria breed) versus the dry season. Locating areas and individual hotspots for malaria gives the medical service providers and community health workers a direct target for treatment at an individual household level, and as a focus for preventative measures. IFP workers utilizing mapping and tracking technology in the Kipushi community. Innovative mapping allows health workers to identify malaria concentrations in the town of Kipushi, DRC. Mr. Friedland said that the impressive success of Ivanhoe’s two-year Know for Sure partnership with Fio in the DRC has caught the attention of global donors and international healthcare providers focused on malaria control and prevention. “As a consequence, Fio’s technology now is being implemented in other Sub-Saharan African countries where malaria is prevalent, including Nigeria, Ethiopia, Kenya and South Africa,” he said. The Know for Sure campaign is teaching children, who are particularly susceptible to malaria, how to get accurate, rapid and effective testing for themselves and their parents. Despite a significant decrease in the incidence of malaria in recent years, the World Health Organization reports that the DRC still accounts for the second-highest number of estimated malaria deaths globally. Malaria causes the deaths of almost half of the estimated 400 children who die each day in the DRC. Fortunately, malaria can be successfully treated when detected early and accurately. DRC Health Ministry staff now are able to remotely monitor, in real time, whether healthcare workers in the field are following testing and treatment protocols. Managers also may view reports on commodity stock, such as diagnostic test strips and treatment medication, the distribution of protective bed nets and test results. “The success of the Know for Sure initiative is a tribute to the cooperation between the government and the private sector that are working together in everybody’s interest to fight malaria,” said Dr. Guy Muswil, the Kamoa Project’s Head of Sustainability. Ivanhoe Mines is advancing its three principal projects in Southern Africa: 1) Mine development at the Platreef platinum-palladium-gold-nickel-copper discovery on the Northern Limb of South Africa’s Bushveld Complex; 2) mine development and exploration at the tier one Kamoa-Kakula copper discovery on the Central African Copperbelt in the Democratic Republic of Congo; and 3) upgrading at the historic, high-grade Kipushi zinc-copper-silver-germanium mine, also on the DRC’s Copperbelt. For details, visit www.ivanhoemines.com. Fio is a global healthcare technology company headquartered in Toronto, Canada. Fio works with a diverse range of public and private organizations around the world to strengthen healthcare delivery and management, with commercial operations currently in Africa, Europe and Latin America. Built on the first integrated platform to guide services, interconnect technologies, and deliver actionable insight, Fio’s products and services address quality, connectivity and data challenges in today’s increasingly decentralised healthcare landscape.